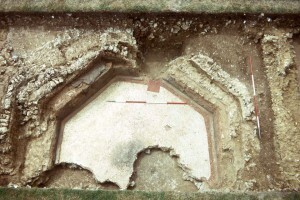 The excavation of the Dewlish Roman villa was the first major field excavation project of Weymouth College of Education. The excavation and fieldwork campaign spanned eleven 4-week summer seasons from 1969-1979 inclusive. The project director was W.G. (Bill) Putnam who had been appointed to the History Department at the College in 1967. In later the years this Department formed the basis of the Archaeology staff at Bournemouth University. There had been two previous investigations of the Dewlish villa, both during the eighteenth century. The first of these interventions took place after fallen trees in the parkland of Dewlish House had exposed the remains of the buildings. It seems that the exposed area was extended to some extent but little is known of what was uncovered or what was found. The octagonal cold plunge bath at Dewlish, Dorset. A second excavation took place in the same century at the request of a Mr Knights. There are scanty details of this episode of investigation but it seems likely that some artefacts from the site were deposited in Dewlish House though their present whereabouts is unknown. It is not known if Mr Knights kept a diary or any written record of his examination of the Dewlish villa site, if so these records have not survived. Bill Putnam excavated the site using a box-grid system. Each box in the grid measured 5m x 5m but this was reduced to 4.5m x 4.5m in some cases if one takes into account the 0.5 metre wide baulks that separated individual boxes in the grid. Emphasis was placed upon the mapping of external and internal walls and in most cases this was done with a commendable degree of precision although it is important to bear in mind that the student digging team did not comprise professional diggers and in the early years of the project the participating students were aspiring teachers and not trainee archaeologists. 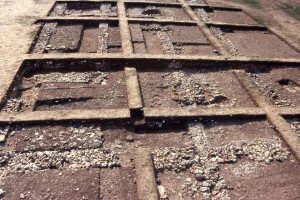 The box grid exacavtion system at Dewlish Roman villa, 1976. As a consequence of the previous episodes of disturbance, the site that Bill Putnam excavated was not rich in finds. 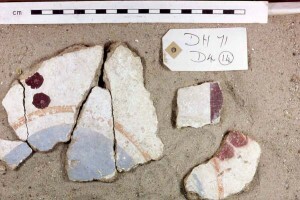 Fragments of painted wall plaster were not necessarily in their original locations and this made it difficult to reconstruct the patterns or images with confidence. Painted plaster fragments from Dewlish. The circular motifs indicate that this was a ceiling design. Bill Putnam produced a number of interim reports on the Dewlish excavations and these were published in the Proceedings of the Dorset Natural History and Archaeological Society. Upon retirement from Bournemouth University in 1995, Putnam made a valiant attempt to set up a post-excavation project leading to a full academic report. Subsequent ill-health prevented the achievement of this goal. Bill Putnam died in 2008 with the site unpublished. In July 2010, Bournemouth University revived the Dewlish villa post-excavation project and since that time considerable progress has been made. Most recently, the site plans have been reassessed and the known extent of the component villa buildings has been phased. Currently, there are six suspected phases of construction and these have been colour-coded and reproduced on an overall site plan that has been created on AutoCAD by Alan Whitaker of Bournemouth Archaeology. The project is now close to publication. Just a final summer of writing should bring the Dewlish project to a close after nearly fifty years. However, new questions are certain to generate new fieldwork at this site in the future.